It's November? What?! This week was a little jammed packed to say the least! 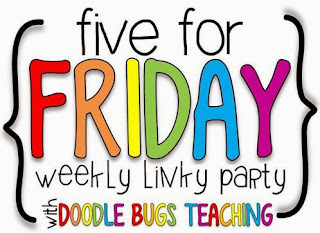 So, I'm linking up with Doodle Bugs Teaching's Five for Friday to try and remember this crazy week! I don't even know where October has gone. But, nonetheless here is a recap of our week. My pups were dressed and ready for Halloween, too bad it poured down rain! Boo! Raincoats and umbrellas were the number one Halloween accessories in Cincy! So, now we have a large bucket of candy for our house and the pups had to be paparazzi'd since I didn't have any trick-or-treaters. One one homeroom is half way through the great state race! They even acquired Hawaii! They have 26 postcards but the other classrooms are not far behind... I can't believe how motivated students are to get to the finish. Although, we did promise a "sweet" victory treat! If you want more information on The Great State Race check it out here. Our reading challenge ended with our Record Breaking Trike Race today! Students were super pumped for teachers and principals riding giant tricycles. The race was a close one at first but the White Lightning pulled away with a the win in the end! Here's a little recap of our celebration for reading 1,000,000 minutes as a school in a week! After a very, very long Friday, I'm exhausted. Plus, I think I'm getting sick. I have a sore throat, my nose is runny, and my eyes burn. This is no good. I ordered pizza so I could get a 2-liter of Sprite and I've already take some E-mergency. I'm in desperation mode. I hope need I feel human again to get caught up on grading and some lesson planning for our next region. Ugh. At least I have a few days off to get better and a snuggle buddy! Hope you had a spook-tacular week! Your Hallow-pups are too cute!! Those giant tricycles look so fun! I bet your kiddos loved it! Welcome to the trusted custom essay writing company. We are professional, experienced, and dedicated to yout success! We fulfill our promises and guarantee that every term paper written by experienced writer! We provide only 100% non-plagiarism essays! Our qualified help is fully customized. Wow, these puppies are so sweet :)I adore dogs ;)An essay about positive influence of pets on people is at Custom-Essays-Online.com. Hacking now has become very simple, This website provide hack for pixel gun 3d game.method to hack pixel gun 3d These hack for pixel gun 3d game is available for free from the mentioned website.